Over the past 40 years, Marine EA-6B Prowlers have been called upon to serve our nation in contingency operations from aircraft carriers and expeditionary airfields all around the globe. For good reason, the legendary Lt. Gen. Tom Miller Jr., best known as the father of the USMC Harriers, called the EA-6B our most important aircraft. A Feb. 7 celebration of the 40th anniversary of the first Marine EA-6B Prowler flight marked an aviation milestone, as the Prowler is now the longest serving jet airplane in Marine Corps history. Its legacy continues as the latest generation of Marines are proudly serving with it at home and abroad until its final sunset, now scheduled for 2019. The thrust of this letter is about the future of the Prowlers and electronic warfare, the sixth function of USMC aviation. 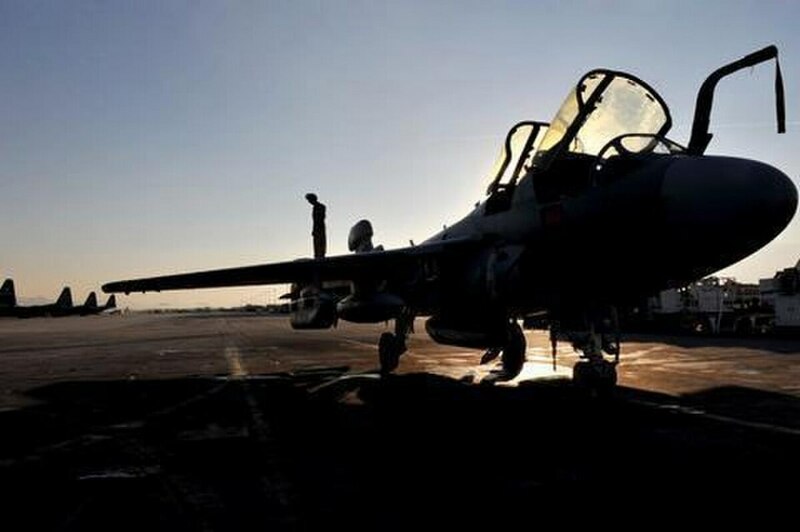 More importantly it's about the combat seasoned aircrews and highly trained maintainers in the VMAQ squadrons who are facing an uncertain future even as our military faces an increasing array of sophisticated near-peer and asymmetrical threats that demand more, not less, electronic warfare assets. The Prowlers are being phased-out without replacement under an over 10-year-old plan. Ca pabilities of the F-35B networked with EW payloads carried by non-dedicated manned aircraft and UAVs. Putting aside the questionable end-state operational capabilities, the delays in fielding F-35Bs and developing EW payloads or UAVs to carry them have created at best a 3 to 5 year gap in expeditionary EW capabilities. This coming as the new administration is committed to destroying ISIS, pushing back on Russian adventu rism, holding North Korea at bay and stopping encroachments by China. The stand-down of a combat ready VMAQ-4 on June 1, just after it completes its current deployment in support of a MAWTS WTI and a Joint Service Red Flag exercise, would seem to send a message that rejuvenating our military is just words. The good news is the Prowlers can and should be extended until at least 2021 to help fill the expeditionary EW gap. The airframes are capable of being operated without major structural rework until 2022 . The CMC has already indicated his desire to beef up the Corps' EW/cyber capabilities in the end strength and in the 2017 budget, so personnel slots should not be an issue. Sorting out the details including right-sizing a residual force would be a welcomed task by the Marines affected by the ill-timed phase out. Why not ask them to submit a plan for consideration? If the Marines agreed to join the Navy in fielding a cost-effective mix of F-35Bs and Super Hornets, a better alternative would be to transition the VMAQs to EA-18Gs and have them continue the expeditionary EW mission developed and supported by Marines since the Vietnam War. With all due respect to the Navy, land-based airborne electronic is not its forte. Marines have and continue to tout MAGTFs as being able to operate independently in a wide range of scenarios that require EW support for both the GCE and the ACE. Finally, as a last resort, career-minded ECMOs and AlQ-99 avionics technicians from the sunsetting VMAQs should be given the opportunity to augment Navy expeditionary squadrons at NAS Whidbey Island. Better yet, to give badly needed geographical balance, one or more of the squadrons should be relocated to MCAS Cherry Point to fill gaps on the flight line due to the delays in the F-35B program. On March 24 a response was received from Lt. Gen. Jon Davis , DC / A vn on behalf of the secretary thanking me for my service and concerns about the impending sundowning of the VMAQ Prowler squadrons. However, all my recommendations were deemed " unsupportable, " including a p lea to offer career-minded aircrews and ECM technicians an opportunity for an exchange tour with their Navy counterparts in the expeditionary EA-18G Growler squadrons. That i s puzzling given the costly investment in common training and their invaluable operational experience , especially given the future dependence by MAGTFs on Navy Growlers. H. Wayne Whitten is a retired USMC colonel and author of " Silent Heroes, U.S. Marines and Airborne Electronic Warfare 1950-2012."